AhoyCaptain has a trolling motor to meet virtually any fishing application and personal taste. But no matter which trolling motor you choose, every trolling motor comes with built-in features and benefits that give you a leg up on the competition and more time on the water. Parts are available for motors from props to battery chargers all at great value . With a full range to cover both freshwater and saltwater fishing needs you will have the best and widest choice available. Trolling is a method of fishing in which some form of bait, such as a fishing lure or a living fish, is drawn on a line through the water. A trolling motor is a small engine affixed to the bow or stern of an angler 's boat that provides source of power for slowly trolling a lure or natural bait through water where fish are sought, or to allow for precision maneuvering of the boat so that the angler can more effectively cast his bait to where the fish are located. 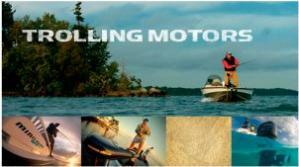 Trolling motors usually are electric powered, with a battery providing its energy source. Trolling motors are often used as an alternative to larger engines that propel fishing boats to and from preferred fishing areas as they are quiet and create little disturbance. Their small propellers can usually be lifted, either manually or via an electronic system, from the water to reduce drag when the larger engine is used for propulsion. Once you have used one you will never go back.